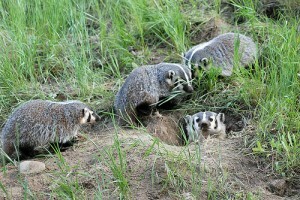 Thompson Rivers University in Kamloops, British Columbia had a few welcome guests this past spring: A female jeffersonii badger (Taxidea taxus jeffersonii) made her den in an embankment on campus and gave birth to a litter of kits. Karl Larsen, a professor at the university who has studied badgers for years, had a view of the den across from his office window. He and his research assistant set up a trail camera near the den to record images and video of the badger family during their stay. Trudy (as she became known) and her kits stayed in the den for a few weeks before moving on to a different site. Their current location is unknown but later reports of a badger living under the deck of a nearby home led to the identification of one of Trudy’s sons. 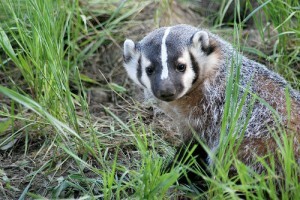 The jeffersonii badger, a subspecies of American badger (Taxidea taxus) occurring only in BC, is listed as endangered in Canada. The population in the province, thought to be around 350 individuals, faces pressures from habitat loss and vehicle collision deaths. Larsen stated that he hopes these badger sightings suggest that the numbers are recovering, rather than reflecting further loss of natural habitat.